To me, the festive season starts on the 1st of December with the Christmas Tree going up, mulled wine on the go and fairy lights all over the house. Every year, the start of December has also meant the start of the Christmas parties, but now with a 7 month old baby in our lives, that has changed from plural to singular. This year I decided to focus my efforts on only one Christmas party, and because of that, I went all out getting ready and indulging in a full mani and pedi to get myself ready for the first night out since James was born. 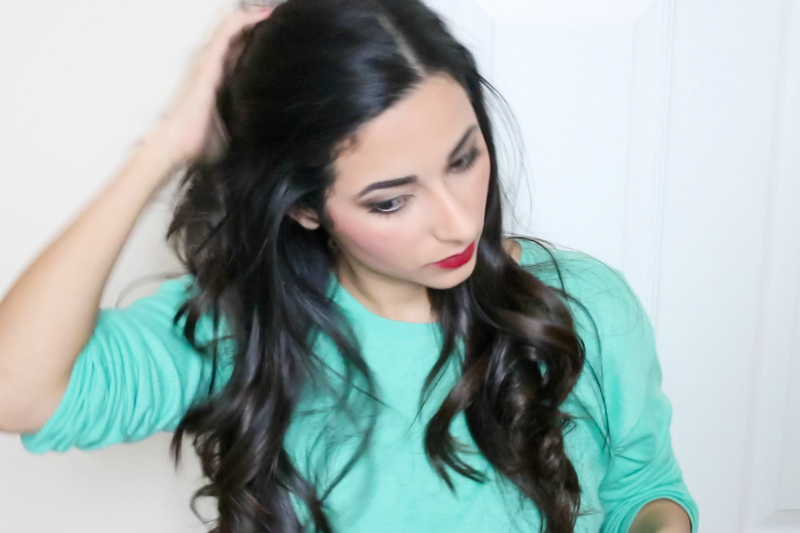 So here is a step-by-step for a full routine before going out to Christmas party. 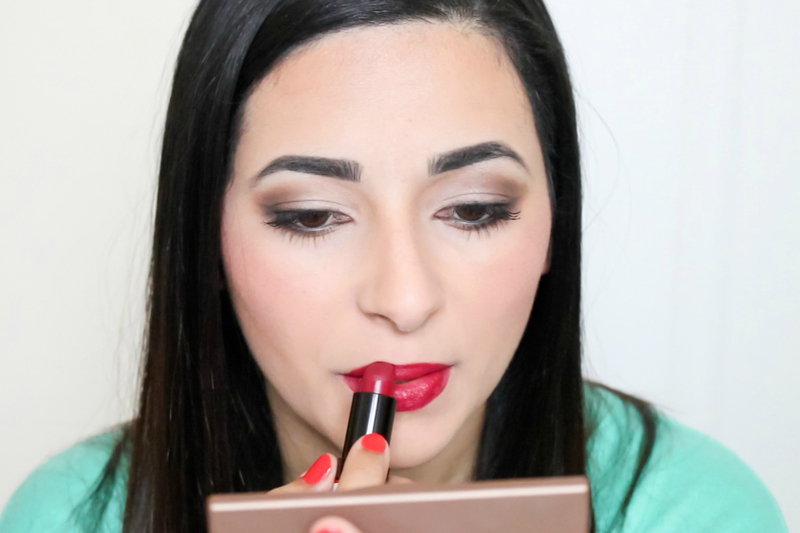 I always search for inspiration on YouTube videos and blogs, especially for makeup ideas, so have a look around and bookmark anything that catches your eye! I put my outfit, shoes, clutch bag and jewellery on the bed and check to see if anything needs ironing or cleaning. A warm bath usually gets me nice and relaxed before getting ready for a night out. 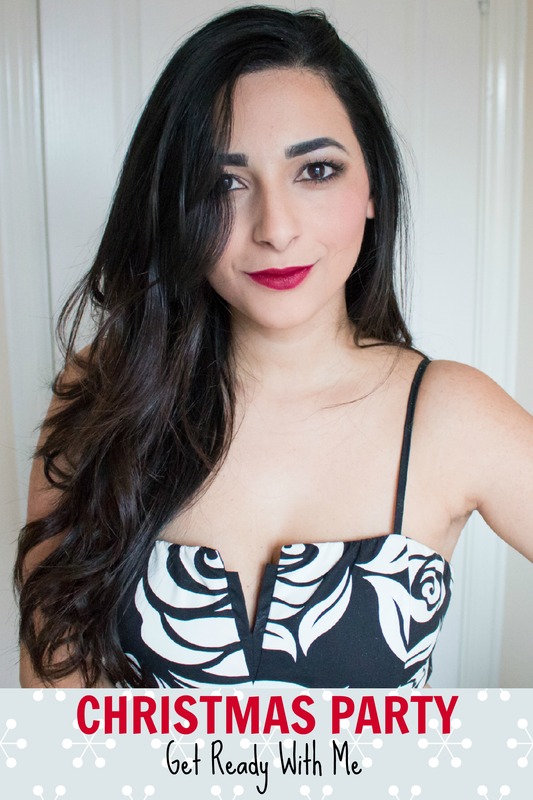 For hair, if I’m straightening my hair, I wash it and give it a blast dry with the hair dryer, but if I’m curling it (which I did for this look), I prefer having slightly dirty hair, so I don’t wash my hair and just rely on dry shampoo to keep it from looking greasy. Gather all the makeup and brushes you will need to create your look. For the hair, put your hair dryer, straightener or curlers on a heat-resistant surface, choose a heat protectant, a finishing hair oil or hair spray, as well as any accessories such as hair grips or hair ties, clips, a brush or comb. Christmas pyjamas will put you into as festive mood ready for your Christmas party, and they are also comfortable loungewear to chill with a glass of mulled wine and some Michael Buble playing on the background. I start with a skincare routine, then move on to bodycare, applying a shimmery moisturiser on my legs, arms and cleavage, after all, if you can’t sparkle during Christmas time, when can you? Before a big night out, I always make sure my feet are in good condition and looking relatively nice, so a mini at-home pedicure is best way to give your tired feet some TLC. Use an electric foot file to get rid of any rough skin, then follow with a foot scrub to loosen up the dead skin, and a foot lotion with moisturising ingredients such as Vitamin E and shea butter to leave your feet feeling as relaxed as possible. 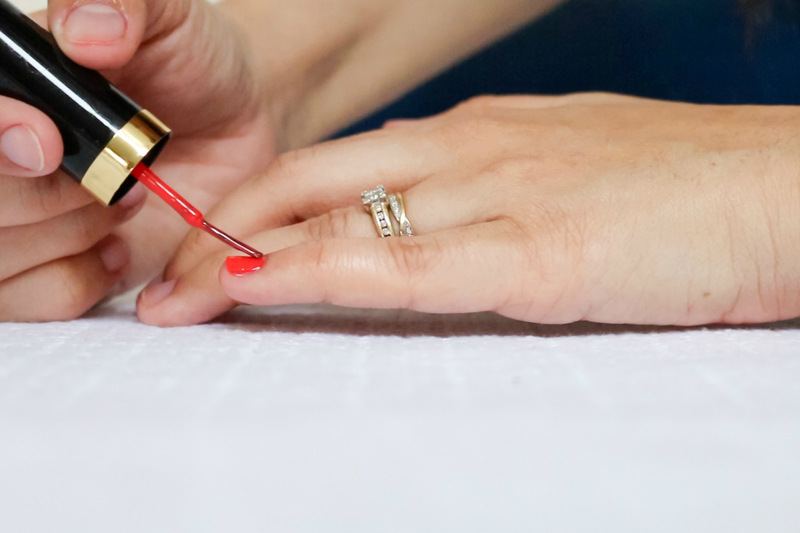 Paint your toes and finger nails with your nail varnish of choice – I like to match my hands and feet, but you could go for different colours if you want. This is where I spend the most time because it usually involves creating a picture-ready flawless base, a smokey eye and a bold lip. This year I went for a red lip, which always has the added bonus of making me feel super fabulous! I’ve done lots of makeup tutorials, so if you’re looking for inspiration, click here to check them out. Curly, messy, straight, natural, wild – it’s up to you! I like to look more glamorous for a Christmas party, so I usually go for some kind of loose bouncy curls, which you can easily achieve by curling bigger sections of hair and using a wide barreled curling wand. If you want to see some hair tutorials, click here. Now that you’re looking pretty presentable and Christmassy, get your shoes and make sure they are comfortable enough for a whole night out, possibly with a lot of dancing involved. If not, there are always heel shields, foot cushions and insoles to help you out. I always pack a couple of blister plasters in my clutch bag, along with my debit card, some cash, house keys, a lipstick and concealer for touch ups, my phone and some breath mints. You’re finally ready to slip into your dress, put on your shoes and accessories and have one final look into the mirror to check that everything looks good. If I’ve done my makeup quite glamorous, I choose a more understated dress and vice-versa. For this party, I went for a simple monochrome dress with a belt to match my shoes, which I think goes really well with a red lip makeup look. Step 10. Take a selfie and go have fun! You wouldn’t dare leaving the house without taking a selfie of your finished look first, would you? A little selfie with flash has the added benefit of double checking that your hair, makeup and outfit look good in flash photography. Look out for a white cast on your face that could be caused by using a foundation with SPF, any flyaways on the top of your head, which can easily be squashed with some hair spray, and anything see-through on your outfit. Now go out, enjoy, drink and be merry – it’s Christmas! If you like watching Get Ready With Me videos, you can watch me get ready for a Christmas Party from start to finish by pressing the play button below or clicking here. 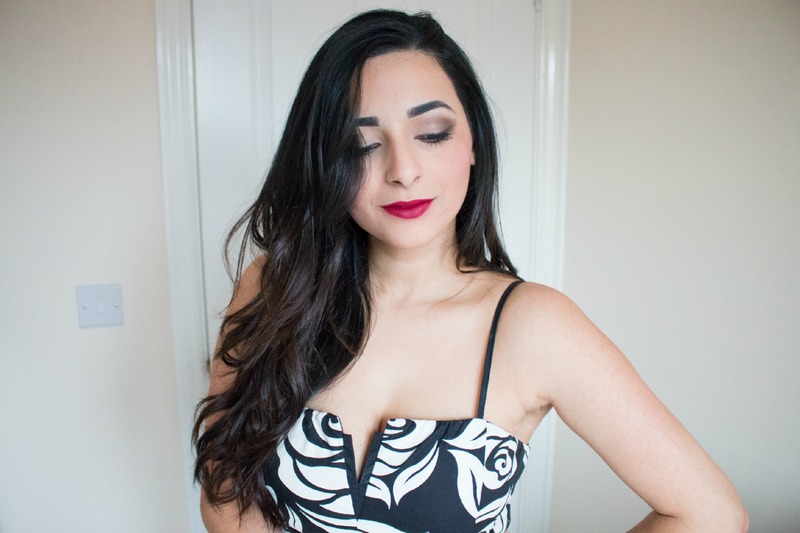 Let me know what you think of my Christmas Party look and if you have any tips to share, please do so on the comments below!